Our goal is to give the trucking industry and the travelers all the information they use daily in any format they choose. We have expanded now to 5 formats with at least 3 more in the works. Thanks to our development team, we are making big progress to make your job, trips and vacation easier. We are adding data daily, so you can help us by sending in ideas to help you. We look at every idea seriously to see if we can use it. We will continue daily to look for ways and ideas to add to our existing database, as well as more formats. All your needs in just ONE digital book! 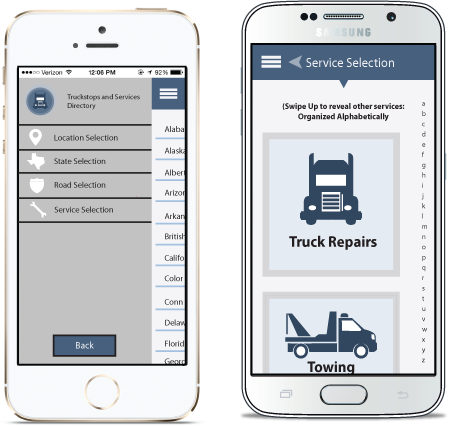 The mobile HTML5 application is now online at https://mobile.truckstopsandservices.com. Once you visit this page it will download the information to your phone. Add it to your home screen on your phone and have access to the complete database even when you don't have an Internet connection. All the information found in the app can also be found online at www.dcbookapp.com! This site gives you more tools to help you navigate the information. This tool is great for pre-planning your trips, or for use when you are at a truckstop for the night with you laptop.